As the first half of 2018 has come and gone, we present the LPL Research Midyear Outlook 2018: The Plot Thickens– taking a deeper dive into the economic forces that may impact global markets. The first half of 2018 has seen a pickup in market volatility. However, the fundamentals of the U.S. economy are generally strong. Thanks to the help of tax cuts and increased investment, the U.S. economy continues to expand. Globally, look for growth to continue, specifically in emerging markets. While investors keep their attention on potential tariffs, we believe the pro-business fundamentals will outweigh the potential impacts. When investors began 2018, we tuned in to the recent fiscal policy changes that were expected to propel economic activity and the financial markets higher in the coming year. The hand-off in leadership from monetary policy to fiscal policy was well underway as a driver of consumer spending, business investment, and corporate profits. Instead of depending on the Federal Reserve (Fed) to move this expansion forward, fiscal incentives are now critical for continued growth, with the new tax law taking the lead. Click below to read the complementary in-depth report with more detailed forecasts on the most relevant topics. We expect clients can remain optimistic about what’s ahead for their investment portfolios. We believe this guide serves as an important reference tool in conjunction with the Granite team’s active management of your long-term goals. The opinions voiced in this material are for general information only and are not intended to provide or be construed as providing specific investment advice or recommendations for any individual security. The economic forecasts set forth in the presentation may not develop as predicted. Past performance is no guarantee of future results. The 2018 FIFA World Cup™ kicks off tomorrow, as 32 countries vie for one of the greatest trophies in the world of sports. The tournament has taken place every four years since 1930 (excluding World War II), making this the 21st World Cup. “Although in no way, shape, or form do we support investing based on potential World Cup winners, wouldn’t you know it that the S&P 500 Index has done quite well when a European country came out on top? In fact, only European and South American countries have ever won a World Cup, with the S&P 500 up 8.6% for the year on average when Europe has won, versus only 1.1% for South America,” explained LPL Research Senior Market Strategist Ryan Detrick. The World Cup was canceled in 1942 and 1946 due to World War II. A European country has won the World Cup 11 times, with South American teams making up the other nine. Europe has won the past three World Cups, making this the longest such win streak for any one continent. Brazil has won the most World Cups, at five. Italy and Germany are tied for second at four. Technically, Germany has only one World Cup (2014); West Germany won the other three. The United States missed the World Cup in 2018 for the first time since 1986. Brazil, France, and Germany are the favorites this year. Today it was announced that the U.S., Mexico, and Canada would co-host the 2026 World Cup. No country has repeated as champs since Brazil in 1958 and 1962. Can Germany do it this year? Enjoy the World Cup, everyone! College for many people is one of the greatest times of their lives. It is a time where one begins to mature into an adult and find out who they truly are. Not to mention a greater earning potential (generally speaking.) However, it is no secret that college is EXPENSIVE and unfortunately it doesn’t seem it will become any cheaper. Not everyone will be able to pay for their kids complete higher education and THAT’S OKAY! A little something can go a long way, especially if you start early. This article today will be discussing one of the most common ways to save for college, a 529 plan. WHAT IS A 529 PLAN? : A 529 plan is a college savings account named after the section of the IRS code that created them. WHAT ARE THE BENEFITS? : Although I believe the biggest benefit of a 529 plan is the fact that it identifies a specific account that keeps people accountable for saving…..there are many other great benefits. A 529 plan allows for tax-deferred investment. This means that as the investments in the account are growing, you don’t have to pay taxes on the growth along the way. This means more money that can compound over the years. Here is the kicker, as long as you use the money for QUALIFIED EDUCATIONAL EXPENSES, you do not have to pay taxes when you take the money out. Awesome! Another great benefit is flexibility. ANYONE can contribute to the account on behalf of the beneficiary. WHAT If THE BENEFICIARY DOESN’T GO TO COLLEGE? : If the beneficiary doesn’t attend a qualified higher education establishment, you can switch the beneficiary. You are able to transfer the benefit to a qualified family member (i.e. brother, sister, Mother, Father, First Cousin.) The worst case is if the beneficiary does not go to college and there is no eligible beneficiary to transfer to, you can take the money out of the account. You will have to pay taxes on the growth and a 10% penalty. Hey, at least you had several years of tax-deferred growth, not the end of the world. WHAT CAN I SPEND IT ON? : Anything related to qualified educational expenses. Common expenses are room and board and tuition. However, you can also use it to purchase a computer, software, textbooks, supplies…. basically anything related to school. DID YOU KNOW: In 2018 under the new tax law you can use a 529 plan to pay for Private K-12 tuition up to $10,000! You can gift up to 5 times the annual gift limit without incurring the federal gift tax! That means you can fund a plan with $150,000 in one year. Great for reducing an estate! HOW DO I ESTABLISH ONE? : My advice would be to work with an advisor. They can help you budget, estimate costs, set expectations, and help you choose your investments. SUMMARY: A 529 plan is one of the best ways to save for college. The flexibility and tax benefits make it one of the most popular options. If you would like more information on how you can get started with a 529 plan, please do not hesitate to call Granite Wealth Management at 1-888-612-5391 or email at info@granitewealthllc.com and we would be glad to help you. The potential for rising inflation has been on the collective mind of market participants in recent weeks, following a larger than expected uptick in wage inflation in the January employment report, which is widely reported as one of the key factors behind the recent pullback in stocks. The latest Consumer Price Index (CPI) report seems to play into the narrative of an upside surprise in inflation, so it is no surprise that markets initially reacted by selling off, with both stock and bond prices moving lower (and bond yields moving higher), though stocks have since recovered and moved off their lows. Consumer prices increased at a faster pace than expected in January, with the CPI rising 0.5% month over month (versus a 0.3% consensus forecast), and core CPI, which excludes food and energy, rising 0.3% (versus 0.2% consensus). Year-over-year CPI and core CPI rose 2.1% and 1.8%, respectively, compared to consensus expectations of 1.9% and 1.7%. Apparel, motor vehicle insurance, and hospital services saw the largest month-over-month gains, though these items are each a relatively small part of the overall CPI calculation (making up just 7.7% of the index combined). Shelter, which makes up approximately 32% of the index, saw less severe but still solid gains as well. business fundamentals. Fiscal policy means increased government spending, tax cuts, and some regulatory relief. We need Congress to enact some policies to help keep this expansion going. As far as business fundamentals, we expect to see improvement in revenue, earnings, and future growth prospects. Increased business spending is also expected to play an important supporting role for the U.S. economy and could see a faster growth trajectory in 2018. For stocks to potentially reach attractive gains, earnings growth will be a key driver. Better global growth is supportive of earnings, and tax reform has the potential to provide an additional boost. All of these factors and more will be important to watch in 2018.
success. Download your copy today! Contact GWM if you would like to discuss further! The Thanksgiving Day holiday can be an enjoyable experience for many as friends and family are celebrated while eating a delicious meal. November also can be enjoyable for those who follow the seasonal statistics for the equity markets; looking back over the past 20 years, stocks tend to move higher during the month. 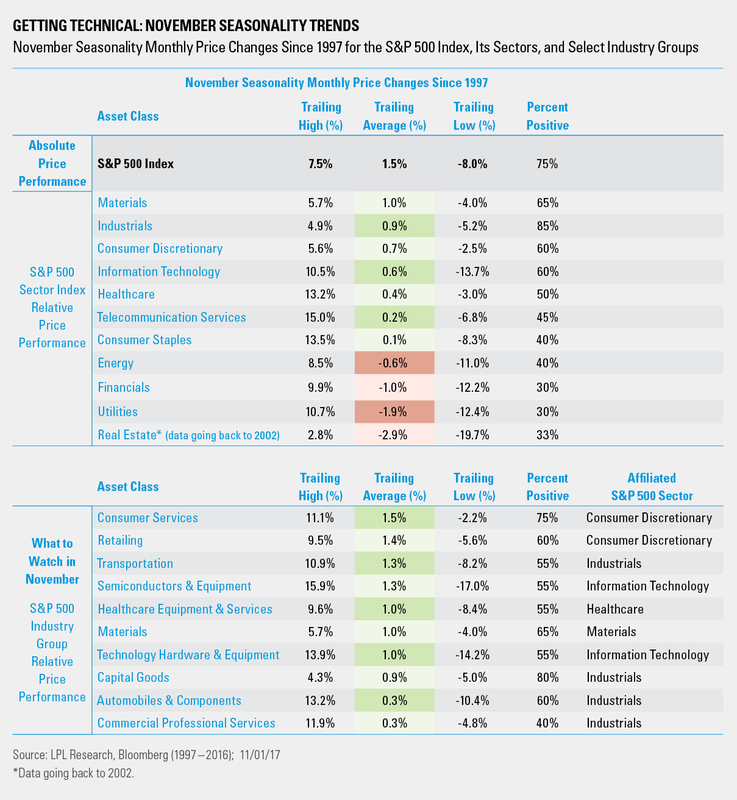 Our latest analysis identified four sectors that have shown a seasonal tendency to outperform the S&P 500 Index during November over the last 20 years—a month when the index has on average moved higher by 1.5%, generating positive returns 75% of the time. As we review the data, it’s important to note that non-seasonal factors still influence performance and should not be ignored. Looking at the table above, the materials sector has tended to exhibit the highest relative strength versus the index in November, on average. This increases the likelihood that the upward trajectory may continue. But, if you are looking for a more targeted strategy this month, out of the top 10 industry groups, the industrials sector has the most breadth, represented by four seasonally strong components. As many of us enjoy the Thanksgiving Day holiday this year, maybe we can focus more of our attention on our friends and family and less on the equity markets; historical data suggests stocks are more likely than not to move higher in November. However, seasonal statistics could help to identify sectors and industries that could better compliment your Thanksgiving meal than a broad-based equity investment. Contact the GWM with any questions! Because of their narrow focus, specialty sector investing, such as healthcare, financials, or energy, will be subject to greater volatility than investing more broadly across many sectors and companies. Enter your email address to Granite Wealth Management and receive notifications of new posts by email.